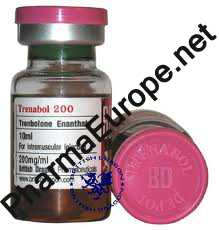 Trenabol 200 is a long-acting injectable steroid with a great effect on protein metabolism. Trenbolone is one of the best effective anabolic compounds, promoting protein synthesis, as well as creating a positive nitrogen balance. It is an appetite stimulant and improves the conversion of proteins. In laboratory tests, it has been demonstrated that trenbolone increases protein and decreases fat deposition. It has proven to be an excellent product for promoting size and strength in the presence of adequate protein and calories, promotes body tissue building processes, and can reverse catabolism. Due to its particular ester, trenbolone enanthate is slower-acting than trenbolone acetate and faster acting than trenbolone hexahydrobenzylcarbonate. Based on its molecular structure, trenabol enanthate is theoretically stronger than either trenbolone acetate or trenbolone hexahydrobenzylcarbonate.